Anatoly Turov paints on ceramic vessels, most notably animals. Each painting reflects a unique style and theme, from still life to bold graphic to romantic street scenes. He maintains small artisan studios in both Russia and California, so you will see both areas reflected in the themes. His work is distinctive and very collectible! Make special note of pieces marked "LE", these are numbered limited editions that treat you with extra details in style and painting technique. 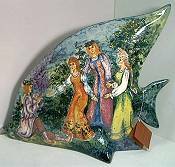 All the talk about Turov animals, yet he is a magnificent artist on tiles for the wall also. This mural is made of twelve 6x6 inch tiles, for overall scene that is ready to frame at 18 x 24 inches. Tiles are rich with glazed colors, glued onto masonite board. This is a one-of-a-kind piece.